St. Anton am Arlberg is a pretty mountain resort which was able to keep its authenticity. A charming village at 1300 m / 4265 ft with an attractive pedestrian street, St. Anton offers all the comforts of an international vacation resort. 270 km / 168 miles prepared slopes guarantee a perfect ski vacation. St. Anton hosted the Alpine Ski World Championships in 2001 and is a very well-known ski resort around the globe. It is one of the rare European ski areas where you can ski the whole day long without using the same chairlift or cable-way twice. Cross-country skiing, ice skating, curling and an illuminated toboggan run are also part of the winter fun. In summer, St. Anton attracts hikers, bikers and friends of other forms of sport. Wellness became very popular in the last few years and various hotels in St. Anton offer a wide choice of wellness treatments. The very modern event and congress center is a must to visit, not just for the possibilities of sports and wellness features it offers, but for the exceptional architecture of the building. St. Anton – a charming resort with metropolitan flair! 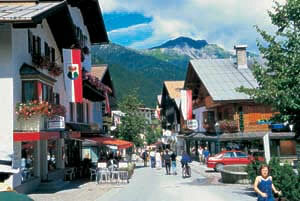 St. Anton and its ski area are well-known in skiing circles. In the early 20th century, Austrian ski pioneer Hannes Schneider invented the modern ski downhill technique which is still used today. More than 80 cable cars and ski lifts, 260 km / 262 miles of groomed slopes and 184 km / 114 miles of deep-snow runs await you. The “Galzigbahn”, a very modern construction with a Ferris wheel inside, has a huge capacity where standing in line is not known anymore. 28 gondolas holding each 24 passengers bring you safely up the mountain. The highest peak “Valluga” is a at 2811 m / 9223 ft. Snowboarders meet at the “Rendl Fly-in Park” at the “Rendl Beach” where they find barriers, slides and a fun box. There is also a speed run which measures your actual speed. 40 km / 25 miles of cross-country ski tracks guide you through the winter wonderland. Rent a toboggan and go down the sled run from Gampen via Nassenrein to the Rodelstall. The 4.3 km / 2.5 mile run is illuminated at night. If you simply like to walk, stroll along the 70 km / 44 miles of cleared pathways. For romantics, a horse drawn sleigh ride is the right thing to do. Sit back and drive into the peaceful Verwall valley, breath the clear air and let your mind wander. Built in 1912, this museum shows the development of the alpine skiing and the evolution of St. Anton as a winter sports resort in 7 exhibition rooms. You’ve read correctly. Arlberg-well.com is the name of the wellness and communication center in St. Anton. Indoor- and outdoor swimming pools, an extensive sauna world, massage facilities, a fitness center, indoor- and outdoor tennis courts and even an ice skating rink is part of the offer. Relax and enjoy. One of the largest old houses, it was classified as a historical monument in 1984. Built in the late middle ages, it served as a salt station and collection house for the salt tax. The wood binding elements are an interesting architectural detail. In winter as in summer, St. Anton offers great programs for children from 5 to 14 years. If your offspring likes to search for hidden treasures, wants to join the “St. Anton Olympic Games” or likes to run around the playground – ask for the kids club and you also get some hours just for yourself. A program also takes place in bad weather. If you are free from giddiness and like to climb at 2500 m / 8202 ft, climb along the 2 km / 1.2 miles long steel rope and try to conquer the rock. Take the cable car until the summit station “Vallugagrat” and after approx 20 minutes, you reach the entry point. Calculate approx 4 to 6 hours to reach the peaks. You get rewarded with a spectacular view. Situated just after the “Arlberg Tunnel” in Tirol, St. Anton is approx 100 km / 62 miles from the closest airport Innsbruck (1 hour 10 minutes by car). The airport in Zurich is 200 km / 124 miles away and Munich approx 250 km / 255 miles. St. Anton is a Eurocity station where all important international express trains stop.